One of the last meals we had in Singapore was also one of the best; and to think Fifty Three (part of the Les Amis group) almost didn’t make it onto the agenda. Wanting to fill a free lunch slot towards the end of our trip, we called last minute for a Saturday reservation, fully expecting to be turned away. Instead we managed to secure ourselves a table quite easily and the restaurant even happily accommodated our request to partake of the 8-course dégustation (thanks to a heads up from e*ting), usually served only in the evening. We were surprised to find only one other table present when we arrived for lunch; as noted by British chef Ryan Clift at Tippling Club local dining patterns are hard to predict – while rave reviews and accolades may translate to mass bookings in other countries, in Singapore this isn’t necessarily the case (even around paydays or holidays). As an aside, Tippling Club’s innovative cocktail-paired tasting menu is well worth trying – I had meant to write it up but my photos from the night were appalling (due partly to dim lighting and mostly to too much alcohol). Anyway I digress. The thing that immediately struck me upon entering the dining room was how remarkably similar the round tables and elegant wooden chairs were to the ones at Noma. Chef Michael Han has spent time there, and it shows. 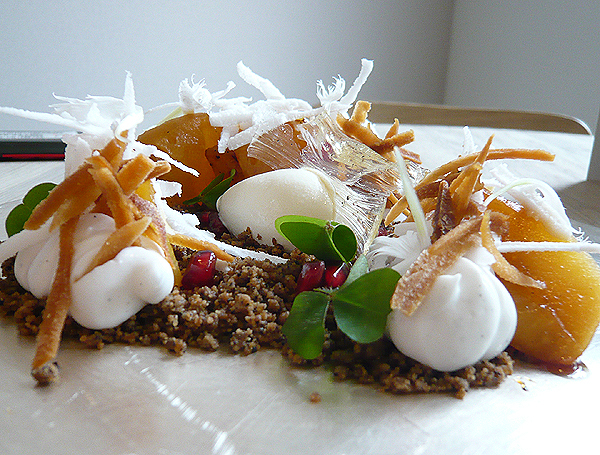 The Danish aesthetic is not only evident in the furnishings but in the food itself, from the cooking techniques and foraged ingredients to the plating and vessels used. 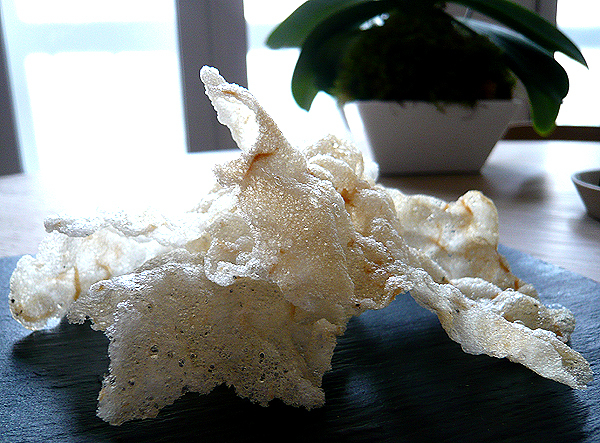 We opened with some barely-there Tapioca and Japanese Sardine Crisps served with a spoonful of carrot emulsion dusted with hazelnut shavings. The crisps were tasty and airy (reminiscent of prawn crackers) and the sweet dip a perfect foil to the deeply savoury fried snack. 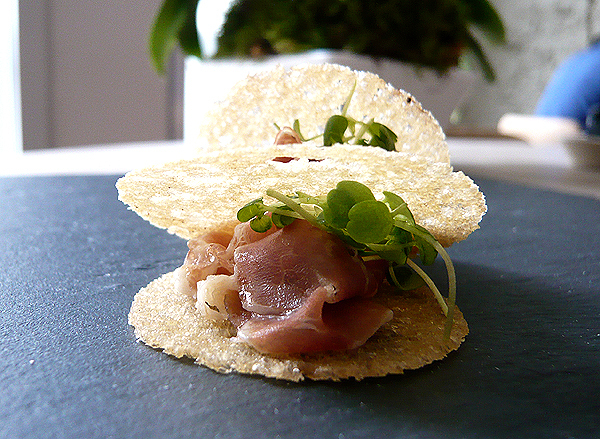 Another tidbit was the Spanish Cured Ham sandwiched in dainty Ciabatta Wafers – a nice crunchy bite with an intense hit of salt balanced by the neutral micro-cress. 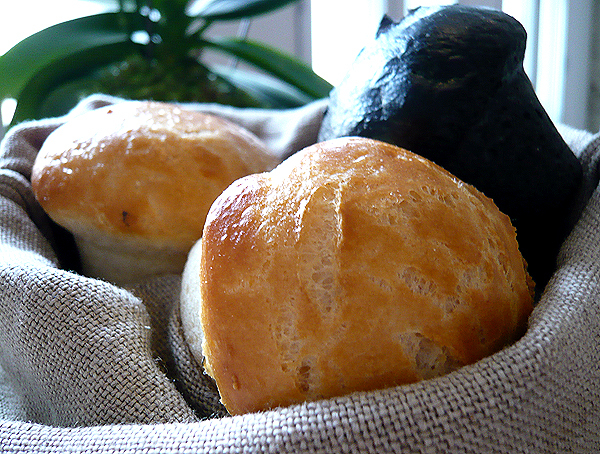 A small sack of invitingly warm rolls arrived next. The striking black Bamboo Charcoal and golden Potato and Yoghurt bread were intriguing but mildly-flavoured. 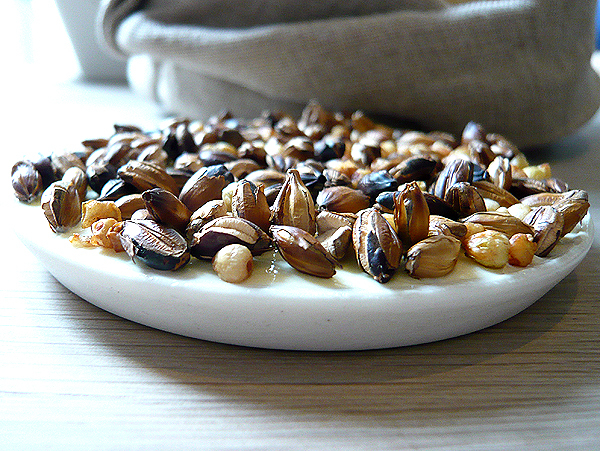 Crusty, with soft centres, they were an excellent vehicle to showcase the creamy salted Danish butter topped with toasted buckwheat and barley (opening pic). 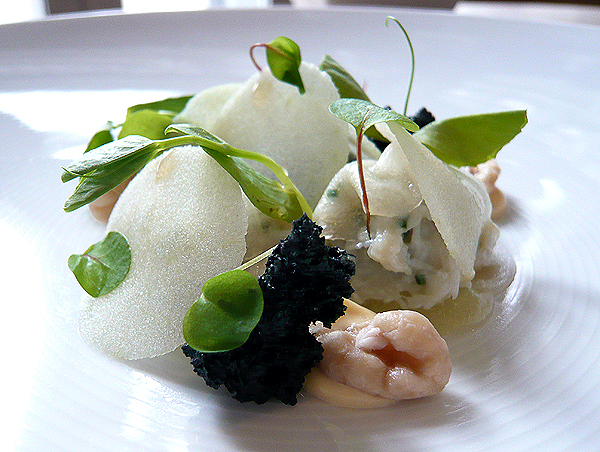 The first dish of Crab, Kohlrabi, Apple and Chickweed boasted sweet, well-seasoned mud crab sitting between thin discs of refreshing apple and kohlrabi, interspersed with bamboo charcoal croutons, walnuts, nut butter and apple purée. 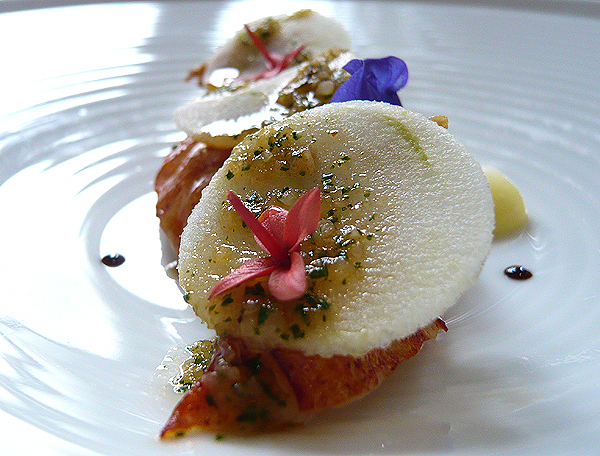 A beautifully composed dish with a great balance of textures. In comparison the kombu-coated Japanese Shrimp with wild and cultivated Coastal Herbs, clam juice and parsley-infused oil was a little one-note. 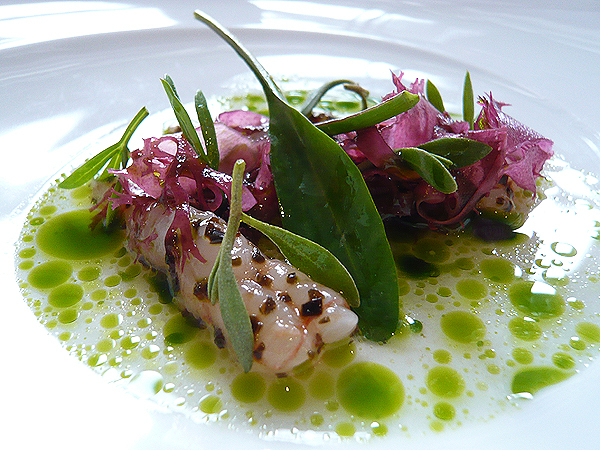 The creamy ebi and sea herbs married well but unfortunately the over-riding taste was that of salt from the clam juice – a touch of acidity would have made a vast improvement. There was a bit of a déjà vu with the next dish of Lobster and Duck Tongue with Textures of Apple, which saw the return of the granny smith slivers and purée. The tartness of the fruit enhanced the expertly-cooked lobster and gelatinous confit tongue, drizzled with a herbed chicken and shallot jus. 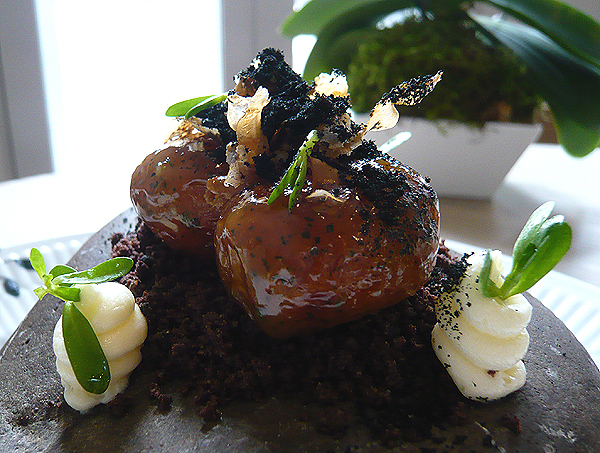 Another wonderful play on textures was the New Potatoes with Sayur Bermis (duckweed), Parmesan and Coffee. The glossy glazed confit tatties were super tender and their sweet earthiness perfectly accentuated by the crispy fried chestnuts, parmesan mayonnaise and ‘soil’ of black panko crumbs, ground hazelnuts, coffee and cocoa. The main of Wagyu Cheek had been seasoned and slow-cooked for 40 hours, rendering it meltingly-soft with a salted beef quality. 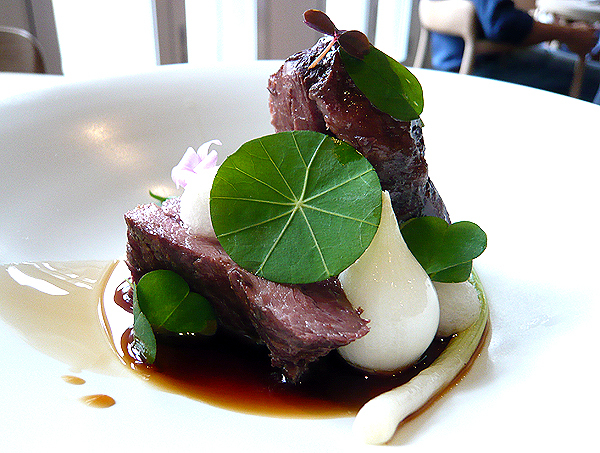 Prettily garnished with nasturtium leaves and oxalis flowers, the meat was nicely complemented by refreshing nashi pear, pearl and green onions and an umami-rich onion consommé. Desserts were exquisitely presented – the Chocolate Forest was a whimsical composition of Enoki Mushroom-adorned Chocolate Mousse, Peanut Sorbet and Yoghurt and Yuzu Jelly-specked Amadei Chocolate Soil. 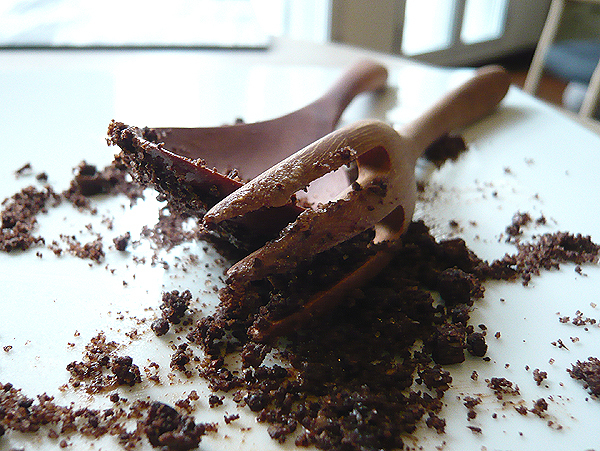 Robust and not too sweet, the chocolate creation was utterly delicious and I quickly polished it off with the garden tool-like utensils. The mushrooms didn’t lend much in taste and were more of a decorative element – a playful wink to the ‘earthiness’ of the dessert. The Five Spiced Pineapple with Brie Ice Cream was another treat for the eyes. I loved the combination of stewed fruit with the light Malibu foam, toasted and fresh coconut, tart bursts of pomegranate and olive soil, but the cheese ice cream did not mesh with the other elements at all and really had no business being on the same plate. We ended with teas chosen from their extensive selection and delightfully tacky apple gummy sweets. It was an exemplary meal, quite staggering considering Han’s lack of formal culinary training (he obtained a Masters in Law before pursuing food as a profession). The young chef clearly has a natural talent, honed no doubt by his apprenticeships at the institutions that are The Fat Duck, Mugaritz and Noma. Definitely one of the Top 3 meals of the trip (the other two being Shinji by Kanesaka and Tippling Club). 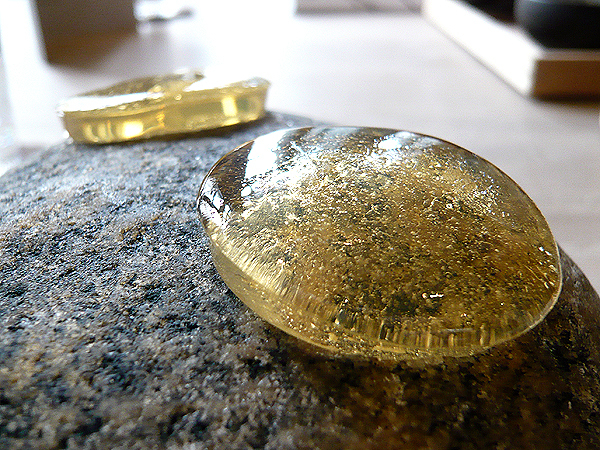 ~ by gourmettraveller on January 19, 2011. Awwwww it looks so beautiful GT!! Your pictures are fab and it sounds like a good lunch was had by all! 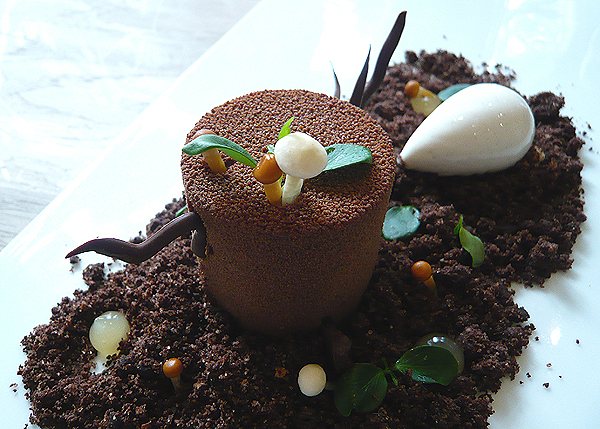 The “Chocolate Forest” looks so yum – love the idea of the garden tool utensils! Good job! Beautiful pictures! And brie ice cream? YUM! Your photos are amazing, as always! 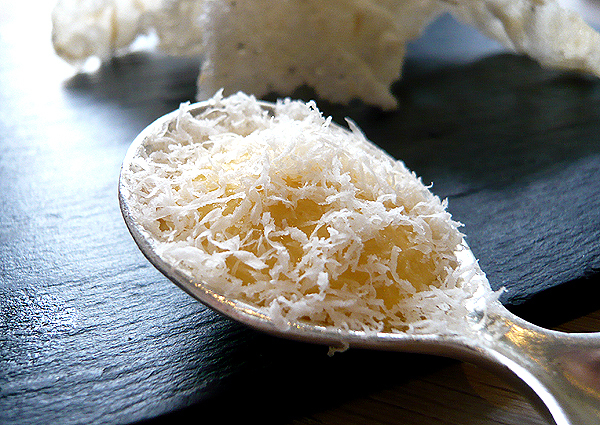 I’m imagining the taste of the spiced pineapple with brie ice cream! What a wonderful review! So unlike anything that I’ve ever experienced, and unfortunately Singapore is not on my horizon. My husband however frequently travels there on business and sometimes has a day or two to himself. I have forwarded your blog for him to peruse. Nicely done! Your pictures are amazing! Fabulous inspiration. Thanks for the wonderful art. Do you know what is it like to work there?? 8am to 12.30am and no real break. It’s complete madness. And you don’t really need formal training in cooking, just work experience will do. Makes me wonder maybe Michael didn’t have the personality to be lawyer. thanks for the mention! glad my post was useful. the plating there is wonderful – your photography makes it even better. totally agree that there were some flavour meshing issues, but the more i think about it, the more i think it’s a price i’m willing to pay for creativity. there’s very little quite like it in asia. i would love to go to shinji and tippling club on my next visit to s’pore too! Indeed, 53 offers great food. I haven’t tried Iggys yet, nor Shinji (perhaps on a next visit there), so it is impossible for me to offer a comparative opinion, but 53 has impressed me.